Chop suey is a dish you'll see on almost any Chinese takeout menu—but that doesn't mean it comes from China. According to culinary legend, the dish of stir-fried meat, egg and vegetables was invented today, August 29, in 1896 in New York City. Chop suey is a dish you'll see on almost any Chinese takeout menu—but that doesn't mean it comes from China. According to culinary legend, the dish of stir-fried meat, egg and vegetables was invented today, August 29, in 1896 in New York City. Li Hongzhang, a diplomat from China, was visiting the city and hosting American guests for dinner. Rather than risk preparing authentic Chinese food for them, Hongzhang asked his chef to invent a dish that would appeal to both Chinese and American palates. Chop suey was born. Or was it? 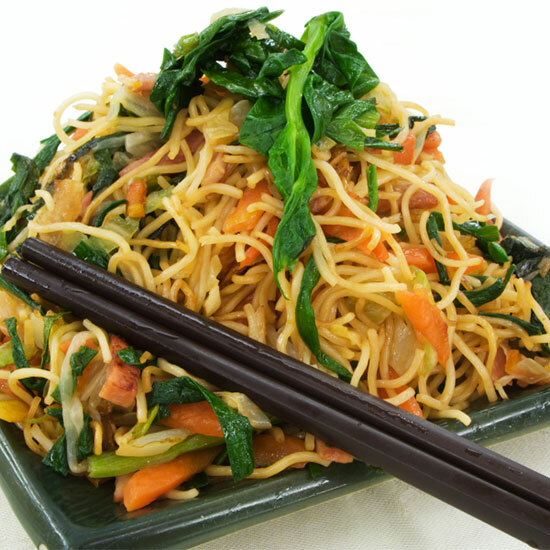 Like many others, the origin story of chop suey appears in several variations. Another is that one of the first Chinese restaurants to open in San Francisco during the Gold Rush was the site of chop suey’s invention. The story goes that one night in 1849, a group of drunk miners piled into Macao and Woosung restaurant. They were hungry. They called out for food. The owner was tired and ready to close up, so instead of whipping up dishes from scratch, he scraped scraps of food from previous customers’ plates and served it to the miners. They loved it. And like that, chop suey was invented. Maybe. The most likely story, unfortunately, is the least interesting: Chinese Americans invented the dish based on tsap seui, a Cantonese dish that translates to "miscellaneous leftovers." Whatever the truth may be, today is as good a day as any to indulge in some Americanized Chinese takeout—to be eaten with a fork, exclusively.